Starting your morning with a mini loaf of this Brownie Crumble Banana Bread and you’re sure to start the day with a smile. A few days before I went into labor I was digging around my freezer looking for a little dinner inspiration when I came across the bag of leftover brownie crumble topping. I thought to myself this would be good on banana bread, so I threw together the batter using my go to banana bread recipe and sprinkled some of the topping in the middle of each mini loaf, as well as on top and eagerly anticipated the results. 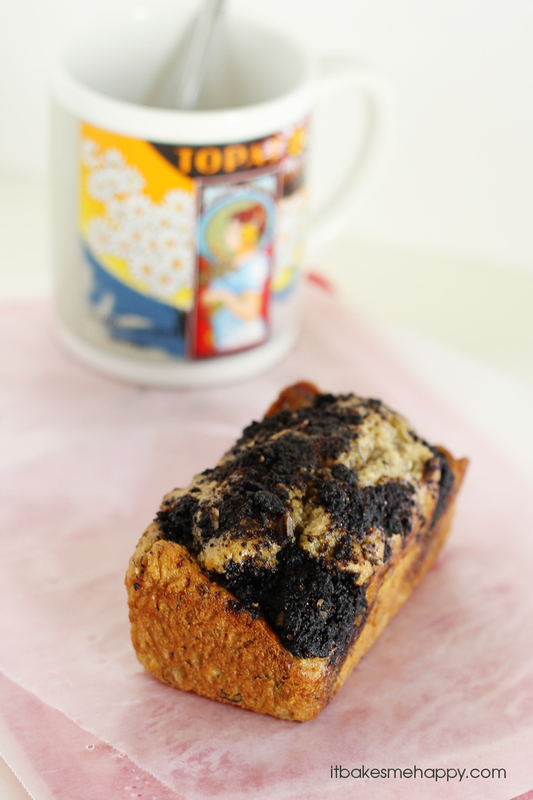 All I can say is yum – if you like chocolate and bananas you need to try this bread! Moist, delicious and not too sweet, it makes a great breakfast or snack. Bake yourself up a loaf or 8 minis like I did. It also freezes well or makes a great gift to share, enjoy and happy baking! Preheat oven to 375º F and coat a large loaf pan or mini loaf pans with cooking spray. Using an electric mixer on medium speed, beat the banana, egg, sugar, vanilla and applesauce. Sift the flour, salt, baking powder and baking soda in another bowl, stir until combined. Beating on low speed, add the dry ingredients to the banana mixture, beat until moist. In a mixing bowl combine the brownie topping ingredients and mix until crumbly. Spread the batter into the loaf pan(s) adding a layer of brownie topping in the middle and again on top. Bake for 50-60 minutes for a large loaf, 25-28 for mini loaves; until a tester comes out mostly clean. Cool in the pan for 10 minutes before turning onto a wire rack, cool completely. The topping recipe is for a full batch, you won't need quite that much, just toss the leftovers into a freezer bag for later. Oh now this is a fantastic idea, Emily! Pinned! OH my goodness this looks AMAZING!! I definitely need to try this!! 🙂 PINNED! Emily, I LOVE this idea. It sounds absolutely delicious! Pinning! I would love for you to share and link up at my weekly TGIF Link Party if you haven’t already this week. Your favorite posts, most popular, recent or new! The party is open every Thursday night and closes Wednesday’s at midnight. http://apeekintomyparadise.blogspot.com/. Hope you will join us! Have a wonderful week! Yummy in my tummy! Stopping by from Wednesday Whatsits. Oh my goodness, that looks and sounds so good!!! What a good idea!